London’s The Connaught clearly doesn’t do things by half, upping its game with the launch of The Mews. 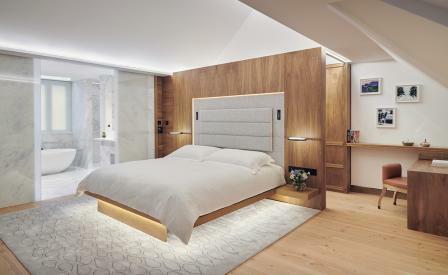 Making the most of its location, in a low-key corner of Mayfair, the legendary hotel has converted a series of former storage rooms to launch a secluded three-storey townhouse, complete with its own private entrance on Adam’s Row. In the hands of architect Michael Blair of Blair Associates Architecture, the interiors are a departure from the usual Connaught aesthetic and more akin to a contemporary residence. Awash with natural light and neutral hues, there are hand-carved timber staircases, Douglas Fir flooring, marble surfaces, bespoke walnut bookshelves, hand-stitched leather details and high ceilings accented with understated concealed lighting. The townhouse has also been crisply dressed with a collection of modern art that includes colourful paintings by Irish artist Richard Gorman, which hang above each of the fireplaces in the living room; sculptures by Camille Henrot and Annie Morris; and a massive David Hockney tome which sits on a Marc Newson-designed stand for Taschen. Equally indulgent, are the little details such as 24-hour butler service, bespoke Smythson stationary – including personalised Mayfair leather journals, and a Moynat leather vanity case overflowing with vintage jewellery pieces, like the gold Givenchy chain link necklace or the elegant dragonfly brooch by D’Orlan, curated by Susan Caplan. There are even matching Burberry coats to throw on, before hopping into the Connaught Bentley that is on standby to whiz you around town. On return, the full offering of hotel facilities is available. This includes the indulgent subterranean Aman Spa, with its seductive black granite swimming pool, and Hélène Darroze’s two-Michelin star dining room. Here, against an intimate India Mahdavi-designed setting of handsome wood panelling, subtle lighting, decorative ceilings and eclectic fabrics, the chef serves a build-your-own tasting menu of contemporary French dishes. Start with the deliciously wicked confit egg yolk topped with Mont d’Or foam and lashings of black truffle and indulge in the buttery yield-to-the-knife A5 Wagyu beef, from the Gunma prefecture in Japan. End on a high note with the signature Baba, that is drizzled with an armagnac of your choice, made by the chef’s own family, and topped with Chantilly cream.